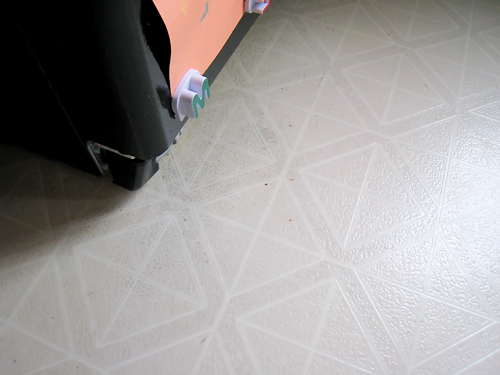 Why, you may ask, am I showing you my perma-dirty, 8 year old, tired and damaged linoleum floor? Because it is dry. Huh? Dry? Yes, dry. For the last year my freezer has been filling up with ice at the bottom and then leaking. We called it incontinent and we just kept putting a hand towel under it to keep the floor dry. Well, we finally bucked up and called the appliance man. (We’ve been putting it off because we just didn’t know how much the repair would be, and were worried that itÂ would not be repairable. We were *not* in a position to buy a new one.) The good news…the refrigerator was *totally* fixable!! And $80 later, our fridge is as good as new. I am so stinking happy!!!!! And why am I so happy that I used five exclamation points? WE’RE GETTING A NEW FLOOR!!!!!!!!!!!!!!!! Wooooooooohooooooooooo!!!! We are going to be doing our part to stimulate the economy and we are putting in a new hardwood floor on our entire lower floor. I am beside myself. Our house is 8 years old. That means our linoleum and carpet is 8 years old. It’s starting to look like it too. To have a brand new floor has been my dream for so long. mmmhmmm…that dark. I can’t wait!!! Refrigerator, Repair it or Replace it. The dark bamboo will definitely do! Definitely do I say on any given day! Hooray! Please forgive me Dr. Seuss and bless the pygmies in New Guinea! P.S. I know nothing about Depends-Yet. 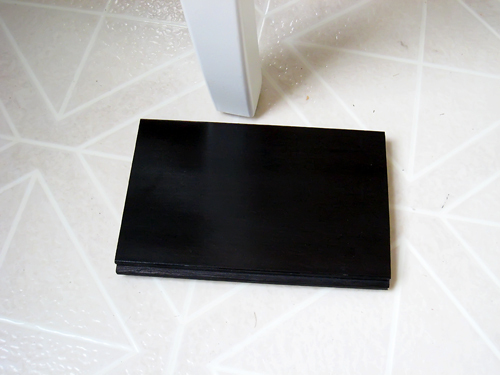 Yay for new DARK floors, they will look awesome! Oooh, how exciting! I love home improvment projects– when they’re DONE. and you will LOVE bamboo, a good choice and ‘dark’ is great, no-one goes with dark anymore, smart choice – it reminds me of dark chocolate *sigh*. good luck with everything! snickering at an incontinent fridge. cheering at lumber liquidators!